Payment : Babypoppits - Baby diaper cakes, towel cakes and personalized gifts from the heart, for the heart., We are specialized in baby diaper cakes, towel cakes and other personalized gifts for babies and toddlers. They serve as perfects gifts for a new baby and/or new parents, as a centerpiece for baby shower, or for birthdays. We accept e-banking, ATM transfers, Cash on Delivery (COD) and Paypal. All prices on this site are in Malaysian Ringgit and all transactions are only in Malaysian Ringgit. Payments are to be made within 3 days of Babypoppits' confirmation email to either of the following accounts below. Orders will be released if payment is not made within 3 days. Customers can make over the counter payments at the bank or via cash deposit ATM machines at any HSBC, RHB or Public Bank branch available nationwide. Customers who have the online banking facility can also opt for online transfers. After selecting products, click on the 'Checkout' button. Delivery information : Choose shipping type and click 'Continue checkout' button. Payment Method : Choose Direct bank deposit or Online banking (whichever applicable). Order confirmation : Check billing/payment information and delivery/shipping information. Click 'Confirm' button. You will receive your order number and you can view your order status at the 'My account' button. Make payments to any of bank accounts mentioned in the confirmation email within 3 days of the email or orders will be released. After payment is made, send notification email to enquiry@babypoppits.com with the template below. Customers can opt to place order online and then make cash payment upon pick up of the goods. As of today, we are able to provide COD services only at areas listed below but we are expanding our networks in months to come. Delivery is FREE for all COD customers. Payment Method : Choose COD if you wish to pick up item from the locations mentioned above. You will receive your order number and you can view your order status at the 'My account' button. Within 3 days, you will receive an order confirmation email from Babypoppits to confirm pick up time and place. 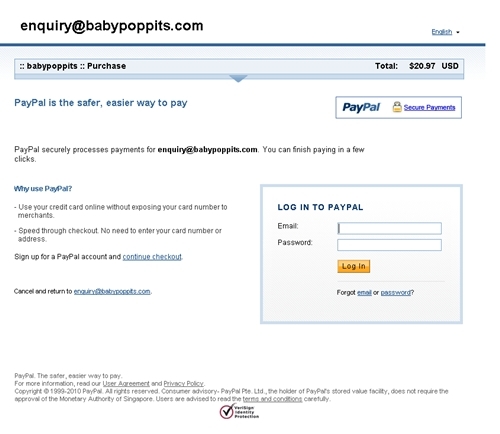 Babypoppits supports Paypal email payments. All payment transaction is done at Paypal's secure website to maintain the highest security protection. After selecting products, click on the 'Checkout' button. Choose Paypal as payment method. You will be redirected to Paypal secure login page. Enter login name and password on the right (if you already have a Paypal account. Or create an account on the left. Automatically your order will appear on the Paypal order & payment confirmation page. Paypal auto converts Malaysian Ringgit (MYR) to US Dollar. Click Pay and Paypal will process your payment automatically.